Hi!! My name is Jen Taylor! I first visited Disney when I was a very little girl. I fell in love before I even knew what I was falling in love with! Growing up my family and I traveled to Disney every year. 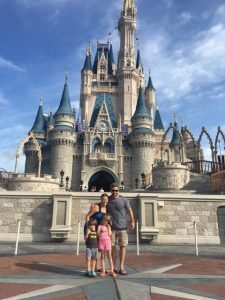 Now that I am married and have two kids of my own (ages 3 & 5) I travel there as often as I possibly can so my children can have those same magical childhood memories! Disney is a magical place that creates the most treasurable memories. Every time I visit it is a completely new experience. Nothing compares to the nostalgia I get seeing my first set of Mickey ears, smelling the buttery popcorn while walking down Main Street or hearing the employee at the Disney gate say “Welcome home”. Disney is home. As a travel agent for MickeyTravels I want to pass that nostalgia on to you! To have you experience that same magic and create those same unforgettable memories that I was blessed to experience. Let me do the work for you so you can focus on having a magical time! Having been to Disney at every stage of my life I understand everyone is seeking different adventures. I’m here to plan that experience for you! Do you have kids? Are you a couple looking for a romantic fun trip? Do you want to have a fun time with friends? Whatever you are looking for I have been there and have explored, enjoyed and tried every stage of Disney travel! Do you want a trip to Disney World, Disneyland, to travel on the Disney Cruises, try an Adventures by Disney, or visit Disney’s Aulani Hawaii? Whatever it is I can help! I will figure out all the details for you, make all your reservations, get you the best fast pass available, send you to the country of your dreams while you sit back and enjoy the feeling of knowing you will soon be in the most magical place in the world! So contact me as soon as possible and let’s get started on your Disney adventure!